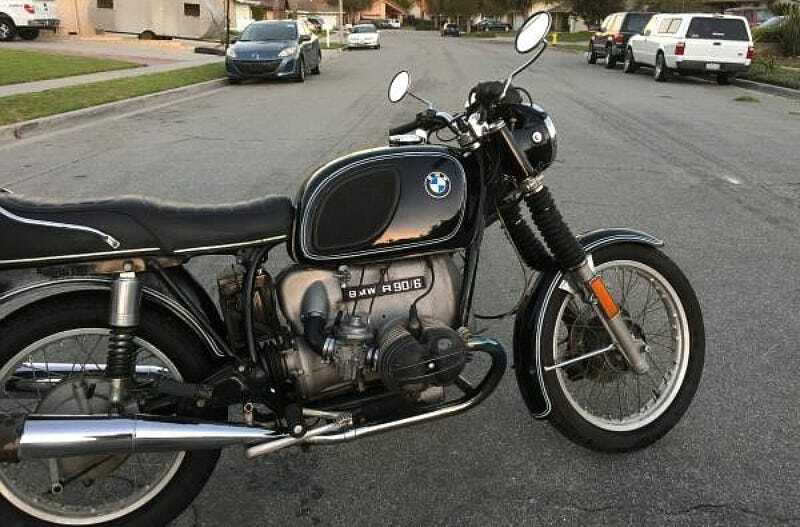 Today’s Nice Price or Crack Pipe Beemer is claimed in its ad to be “almost ready to go.” We’ll have to see if this presently non-running R90 is also priced to make it worth staying. back in the ‘70s, Dr. John used to sing about being in the right place at the wrong time. Conversely, yesterday’s 1996 BMW 725tds proved to be the right car with the wrong mill. Sure it shunned an automatic for a five-speed, as would most of us, but its questionable legality in this locality, expectedly modest frugality, and general irrationality doomed its price to a 72% Crack Pipe loss. Hell, the vote was just a formality. BMW isn’t just all smoker sedans and more crossovers than San Ysidro on Sunday. For the longest time, they’ve also been all about the bikes. Now, a lot of manufacturers have nicknames - Chevrolet has “Chevy,” Porsche has “Porsh,” and Volkswagen has “Lying Sacks of Corporate Shite.” Did you know however, that BMW has two major nicknames, differentiated by whether it’s applied to their cars or bikes? When referencing a BMW automobile it’s generally acceptable to refer to them as Bimmers. Try it, it’s fun - biiiiimmmer. Their bikes however, go by Beemer, which aligns with the common nickname for BSA motorcycles — Beezers. You can call today’s 1975 BMW R90/6 anything you want, just don’t call it late for dinner. Actually this bike might make you late for everything as it’s presently refusing to fire up. BMW has been building motorcycles for almost a century, and their first, the 1923 R32 featured the same layout as this one - horizontally opposed, air-cooled twin, shaft drive, BMW logos, etc. This one’s a bit more sophisticated however, offering tubular forks up front, a disc brake at their lower terminus, and of course a lot more displacement. The R90 was in fact the biggest of the Slash-Six series when it was introduced in 1974. At 462 pounds the bike’s also not light, but is comparatively so when compared to other, similar displacement bikes of the era. That displacement is 898ccs, which was good, when new, for 60 horsepower, and gave a top speed of 115 miles per hour. A five-speed transmission backs the engine up, and these were BMW’s first bikes without a kick starter. You’ll be making good use of this one’s electric spinner as the ad notes that a plethora of new parts - battery, carbs, voltage regulator, plugs, petcocks and brakes - haven’t overcome the bike’s reticence to putting some fire in its hole. You need four things for internal combustion to reliably internally combust: fuel, air, spark, compression, plus a general sense that there’s all happening around the same time. One of those elements has gone missing on this bike, and considering that it’s naked twin without much in the way of mechanical complication, I’m guessing that it shouldn’t be too hard to figure out which one of those it is, and then devise a fix. The ad says everything else is in working order. To be honest with you, I’m itching to dive into this bike and get it running. And it’s not even my bike! The seller says that a broken ankle has quelled his interest in riding and was the impetus for the sale of the bike. Along with the two-wheeler you apparently get from him a buttload of parts including a fairing, panniers, and what’s described as a bunch of NOS stuff. That’s New Old Stock, not the nitrous maker, by the way. But why would you want all that? Why wouldn’t you go for a running Slash-Six? Or hell, any number of modern bikes that don’t have wooden brakes, wooly suspensions, or are actually running? Well, one of the main reasons is that the R90/6 is one damn-fine looking machine - this is a classic bike that, running or not, would class up any garage. And when this one gets running it should also prove to be one of the nicest-sounding bikes around. The twin pipe exhaust on these, like on a British twin, can prove melodious and wonderful. Another reason why you might want to take a look at this one is its $2,800 asking price. That’s cheap for an R90, and considering the package offer for this one, it might prove quite the deal. Of course, that’s just what we’re here to find out. What do you think about this big Beemer and its $2,800 price? Is that a deal for so a classic bike? Or, is that price just something that you can’t run with? Ventura CA Craigslist, or go here if the ad disappears.